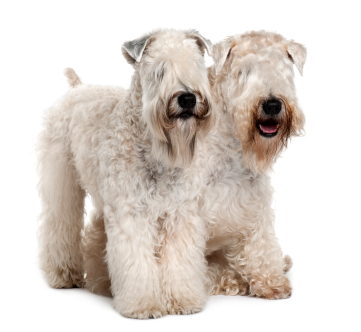 Learn about the temperament and personality of the Soft Coated Wheaten Terrier. Discover what he's like to live with, his traits and characteristics and how he generally behaves. And look at lots of Soft Coated Wheaten Terrier photos. The Soft Coated Wheaten Terrier is formidable, energetic, determined, bossy, feisty, scrappy and fearless. His prey-drive is high and he will chase anything that moves. He's always up for a good argument with another dog and will not back down from a fight, no matter how big the other dog is. Though, he's less aggressive then many other terriers. He won't tolerate being treated badly by a child, but he is very gentle and loving with respectful children. He's highly playful. He's quick to bark. The Soft Coated Wheaten Terrier is moderately easy to train. He learns new commands at the average rate. He is neither difficult nor easy to train. The Soft Coated Wheaten Terrier sheds practically no hair at all. You'll virtually never find a hair in your home!